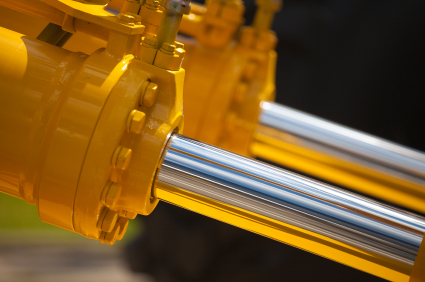 The best way to run a hydraulic system smoothly is to choose the right hydraulic fluids. All hydraulic systems require a pump in order to create pressure. The amount of pressure that is needed is basically what justifies the performances specifications of the hydraulic oil required. Hydraulic oils must display good oxidation resistance, good anti-wear performance, high thermal stability, and compatibility with non-ferrous metals. (on separate definition page: A non-ferrous metal is any metal, including alloys, that does not contain iron in appreciable amounts. Generally more expensive than ferrous metals, non-ferrous metals are used because of desirable properties such as low weight, higher conductivity, non-magnetic property and/or resistance to corrosion.] Some non-ferrous materials are also used in the iron and steel industries.) Good foam control, rapid water separability, and compatibility with plastics, coatings, paints, elastomers, and sealants is also required. Combining high performance base oils and certain additives allows this to be achieved.